At some point, we’ve probably all seen one or more variations of the marketing pie-chart. 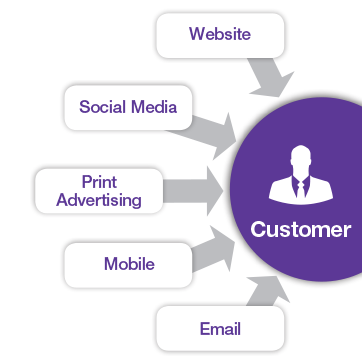 It is a perfectly rounded image with your customer at the center. Representing various pieces of the pie are the marketing channels with social media being one of them. This pie-chart image is designed to convey brand consistency across all channels. This insures that your customers will have a similar brand experience regardless of the channel that reaches him or her. The social media channels or pieces of the pie are a very important part of this wheel. If this gets you to think and fret over your brand identity, fear not. It’s really no more complicated than managing and maintaining your own brand personality. Does your brand have similar images or graphics across all social media channels? A consistent and creative visual identity is essential for a positive brand experience. Not doing so could confuse your customer. You’ll also notice that each social channel has a unique layout. Make sure images are properly formatted for a consistent look. Every brand needs a personality or voice. What is this for your brand? Just like a human voice, there are many variations, from tenor to baritone. Whatever the pitch of your brand voice is, it should always have integrity, be authentic, helpful, and seek to serve others. If you’re not sure what your brand voice is, get to know your audience. If you are really stuck, think about your favorite brands, why you follow them and how they interact with you. Mimic their brand voice or get ideas from their approach to come up with the overall personality that best suits your brand. 3. How often and which channel? When a customer calls your business, has a conversation with you in-person, or sends you an email, what do you do? It’s a no-brainer; you simply respond. Yet eighty percent of businesses who start out using social media marketing quit after three short months. Just like you would never stop engaging with a customer on other channels, neither should you on social media. The key is to consistently post on social media. Be selective. Choose two or three sites where you will find your customers. Posting once or twice each month isn’t enough to be visible. Intersperse your social media postings with a direct mail campaign or email campaign. You want them to remember you and your company and easily find you. And not least, it’s very important to regularly look at the results of your marketing efforts. If one channel is more effective at reaching your customer, make it a priority and enhance it AND be sure not to neglect the other channels. While developing a social media strategy and maintaining it can seem overwhelming, it’s really no different than a brand strategy we manage every day — our own. As individuals we have a brand persona. Our friends and family know us for our personality traits and expect us to act accordingly. At times we’ll test our own personality barriers and do something that is slightly out of character. If done with thoughtful intentions, it can lead to closer relationships or a good laugh. Creating and managing your social media marketing efforts are no different.